Back is embossed with an ornate horsehead with flowers. This 1.5" wide lead free pewter pendant is made in the USA by Sweet Bird Studio. It comes on a stainless steel "S" hook that easily attaches to any halter. It's accented with a turquoise resin bead. 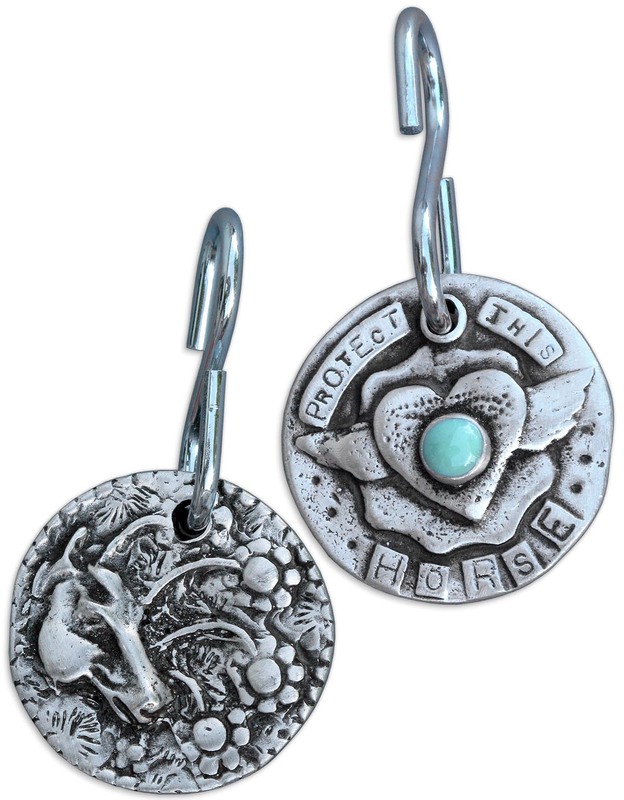 Horses pictured are Cherri C's Oakley and Ace, who is wearing the pewter Protect This Horse Bridle Tag. Cherri likely has one of the most well-traveled Protect This Horse Bridle Medallions out there. Purchased in 2011, it's been on the bridle of 3 different mounts, each carrying her safely on trails all over the USA. Zoom in to see how the medallion is so worn that it's no longer round, some of the words are now missing and though the turquoise is polished a bit flatter, it's still bright. Cherri considers it an essential part of her trail riding gear.